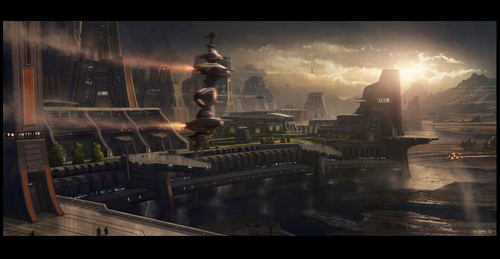 We thought we would end the week with your first look at an alien world: the Xi’An industrial planet of Rihlah IV. Located just across the border, Rihlah is an ideal destination for traders looking to acquire goods not found in UEE space. 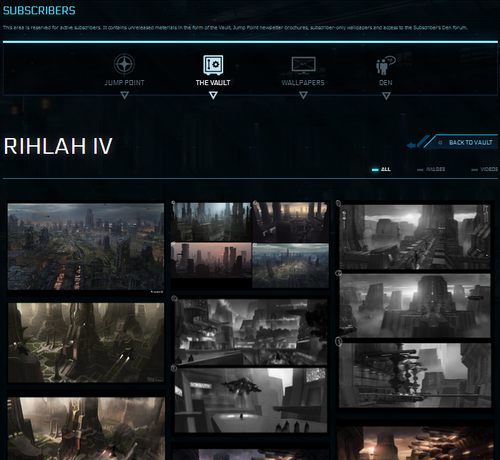 The Rihlah System was unlocked by backers during the July livestream event; you can find a full description in the unlock Comm-Link. These pieces of concept art, showing ground and aerial views of the planet, are the initial ‘look and feel’ pieces that our level designers and artists will use to create the location itself. The aerial shot is what a player should see when landing on the planet and the ground shot is the initial landing area where you will get out of your ship and walk around. Both pieces were developed by artist Dennis Chan with the goal of indicating a unique and distinctly non-human style. You’ve previously seen how we’ve taken Terra from stage to interactive environment… now imagine how cool it will be to explore a truly alien world! We also have some additional information for subscribers: we’ve added a dozen of the work-in-progress pieces that lead to the Rihlah artwork to the Vault. 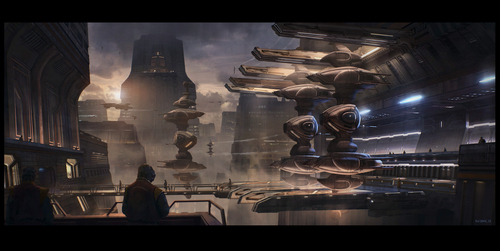 The Vault, available only to development subscribers, collects work-in-progress art showing even more detail about how Star Citizen is made! Subscriptions are an extra way to support Star Citizen and all fees go directly to bonus content for the community, like the Wingman’s Hangar broadcast. Subscribers get access to the Vault plus a monthly online newsletter, Jump Point, and a variety of other rewards! You can learn more here.